Hey ladies and gents! I'm back at #AskAwayFriday again this week! 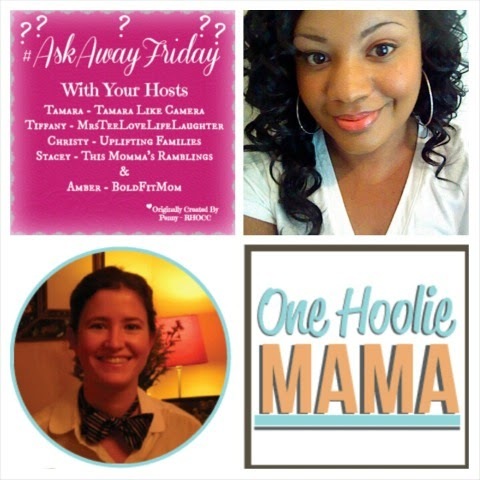 For today's installment of Ask Away Friday, I've partnered up with Suzanna over at One Hoolie Mama. Cool blog name, right? Suzanna calls herself the "hoolie mama," as she is the mother of a baby boy and a few fur children-- whom she affectionately call her hooligans, or hoolies. At One Hoolie Mama, she blogs about her life with her husband and the hoolies, as well as her love of running and crafting. It was so cool to check out her blog and get to know her better this week. Below are the questions Suzanna asked me and my responses to them. How do you like to take time for yourself during the day - do you prefer to read, do your nails, exercise, craft, write - what's your preference? My favorite way to take time for myself at home would definitely be indulging in a great read or two. Usually at night when the kiddies are fast asleep and all of my day's work is done, you can find me curled up with a good book. I probably have my journal somewhere close so that I can get some writing in, too. And maybe, just maybe, if sleep doesn't come soon, I'll pull that polish out and get my nails together. Lol. If your husband were to describe you in one word, what word do you think he would pick and why? I asked him this last night before he left for work, and he asked me if it was a trick question. Ha! But I believe if he had to describe me in only one word, he would choose compassionate. He always says I see the best in others and try to make everyone around me smile. As you have been taking steps to live fearlessly, what is one on the most rewarding things that has happened to you? The most rewarding thing that has happened since trying to move past my fears, is that my overall approach to life is changing. Usually, when presented with a new opportunity or situation, I'll over-analyze it a million times in my head. I'll question myself as to whether I should do it or not, I'll wonder if I'm doing the right thing for way too long. So much internal dialogue goes on that I will usually talk myself out of a situation before I am even truly involved. Does that ever happen to you? Nowadays, I'll say "why not?" and try something new without a second thought. Well, most of the time! What has been the most exciting perk you've received because of your blog? I believe the most exciting perk I've received because of my blog is knowing that people actually read it and enjoy what I write. Finding out my mom reads my blog blew me away! Encouragement from my aunt, my best friend, and other people I know personally really make me feel like I am doing something worthwhile---especially when there were times I've considered quitting. What is your favorite part of blogging? 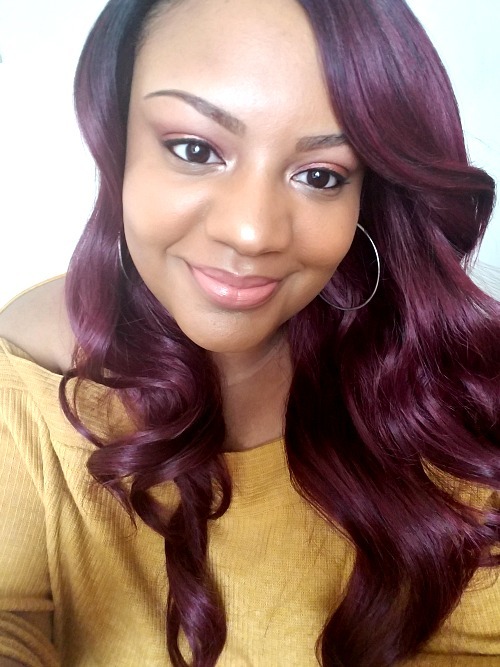 My favorite part of blogging is connecting with others out here in the blogosphere and discovering others I can relate to. What do you find the most challenging about blogging? The things I find the most challenging about blogging are finding a balance between real life and blog life-- if I could maintain more balance, I could be more consistent and actually stick to my editorial calendar lol! 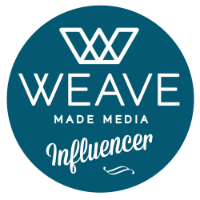 Another thing would be making sure I am blogging about something that is actually contributing to the blogosphere-- I always hope that what I'm sharing is something that may help someone in some way. What is one thing that always makes you laugh? Reruns of Martin. I can watch Martin when I'm having a bad day, and my spirits are instantly lifted. I could watch this show every day without growing tired of it. If you had to pick just one thing, what is your favorite thing about your Hubby? It's so hard to pick one thing. He has so many great qualities! I think one of the things I love most about J is how grounded he is. He always keeps a cool head and rarely lets anything bother him. He keeps a cool demeanor, is a man of few words, but stands firm in what he says. It's a rare thing for anything or anyone make him act out of character. His personality really compliments mine, as I'm known to show my emotions and really react when provoked. He keeps me grounded and often reminds me not to tell others tailor my emotions. It's been so much fun answering Suzanne's questions! 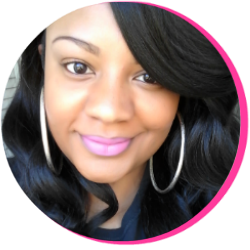 To get more familiar with the Hoolie Mama herself, click the button below and show her blog some love. Her answers to my questions go live today as well, so make sure you check them out and tell her I sent ya!